beautiful small party but a great experience! strawberries and a cute crash-helmet with Minnie Mouse! Aren’t they cute???? 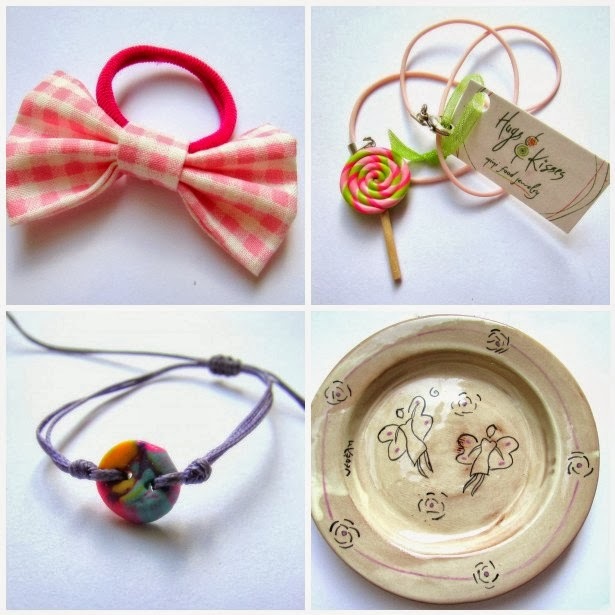 A gorgeous Pink Bow for her hair from Akamatra, a cute and so delicious Lollipop Necklace in pastel tones from Ada, a unique macrame bracelet with a fantastic button from polymer clay from Chris and a one of a kind ceramic plate with amazing fairy tales from Anatoli. Thank you ladies!!!! We had a great time and I am really surprised how easy years pass and how fast my girl grows up! So Happy Birthday my Princess!!!! Happy B-day to your little princess and may she always have a big smile on her face!!! Love all the pretty gifts! Happy bday to your little one!Hope she is always happy and loved!The gifts were all gorgeous!I envy the Lollipo necklace, I think is really cute! Happy happy birthday for your sweetie! !AriadnefromGreece!